Many of us face dry and flaky skin in the winter. It gets worse for the people already have dry skin. They may experience patchiness, flakiness, and itchiness resulting in dull and uneven looking skin. There are many natural way to moisturize your skin healthy and hydrated. 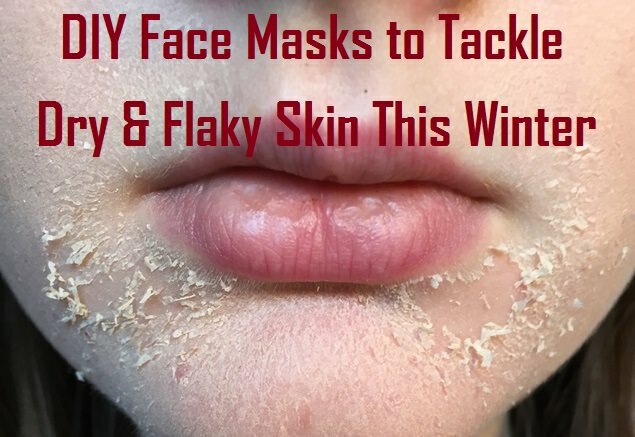 Here I am showing you some simple DIY face masks that will tackle your dry skin in the winter. Coconut oil and honey both are rich in moisturizing and restorative properties, combining these ingredients incredibly nourishing for the skin. 1. Mix 1 tablespoon of coconut oil with 1 tablespoon of honey. 2. Apply this mixture on your face, neck and hands. 3. Leave it for 20 minutes. 4. Rinse off with water and pat dry your skin. Note: you can substitute coconut oil with olive oil. Banana and honey has natural moisturizing properties to provide instant softness for the skin. 1. Mash one ripe of banana and add 2 tablespoon of honey. 2. Blend them to make a smooth paste. 3. Apply the face mask on your skin and leave it for 20 minutes before rinse off with cold water. Raw milk has vitamin B, calcium and antioxidants properties while the honey is natural humectant. Combination of these ingredients provides hydrates and soothes the irritated skin. 1. Mix 2 tablespoons of raw, unboiled milk with 2 teaspoons of honey. 2. Apply this paste on your face, neck, elbows and knees. 3. Wait for dry it completely then wash with normal water. Note: you can also use milk powder instead of raw milk. Use unflavoured whole egg mayonnaise for the best results. Mayonnaise has moisturizing properties, adding the baby oil into it, to make it more potent. 1. Mix 2 tablespoons of unflavoured mayonnaise and 1 tablespoon of baby oil. 2. Spread it on your face, neck and hands. 3. Leave it for 20 minutes, and then wash with lukewarm water. Almond oil is rich in vitamin E, fatty acids, proteins, potassium and zinc, while the egg yolk works as a super moisturizing agent. Combination of these ingredients becomes a good skincare product. 1. Mix an egg yolk with 2 tablespoons of almond oil. You can add few drops of lemon juice in it to reduce smell of egg. 2. Apply it on your dry areas like feet, elbows, knees and face. 3. Wash your skin after 10 minutes. Banana and natural cream both have the moisturizing properties that provide the soft and smooth skin during the winter days. 1. Mash one banana ripe with a fork. 2. Add few teaspoons of natural cream. 3. Mix them to make smooth paste and apply on your face and neck. 4. Leave it for 20 minutes then wipe it off with damp cloth and rinse. Aloe vera is a perfect natural skincare ingredient, rich in moisturizing properties. Combination of its gel with honey and you has a magic mixture for dry skin. 1. Mix 2 tablespoons of fresh aloe vera gel with 1 teaspoon of honey. 2. Mix them to make lump-free paste. 3. Apply it on your dry skin areas, and leave it for 30 minutes before wash off with lukewarm water. Also, check out DIY Face Cream for Dry Skin here at @BeautyEnhancers.